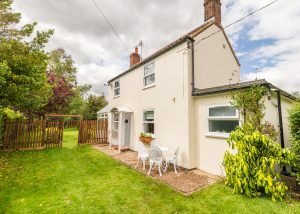 Oak Cottage is situated in a quiet and tranquil lane on the outskirts of the Happisburgh village in Norfolk. 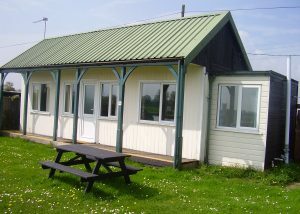 It is a 20 minute walk to the lovely dog-friendly Star Inn at Lessingham, and a 40 min walk to Cart Gap (dog friendly) beach….or a 5 minute car drive! Happisburgh village is a 30 minute walk in the other direction and it has a lovely sandy beach, another local dog friendly pub (The Hill House) and the iconic lighthouse. The village is a peaceful and traditional seaside village with a little village shop and an excellent fresh fish shop. Oak Cottage has a nice sized and very, very secure private garden and off road parking for 3 cars. Inside the cottage is cosy, comfy and kept to a high standard of cleanliness. Open the paddock gates where there is off road parking for 2 cars on the gravel drive. If your party are arriving in 3 cars, there is an extra off-road parking space at the bottom of the garden (road side). There is a separate entrance gate from this space to save you walking round to the front of the cottage. Walk in through the front door where there is a handy boot room to deposit wet clothes, outdoor shoes and umbrellas and dog leads. A big enough space to towel dry any wet or muddy pooches. Supplies of dog towels are left here. The galley style kitchen has views over the front garden and outside feeding area. The kitchen is furnished in a cottage style with freestanding 5 feet high fridge freezer, electric (waist high) oven and hob, and microwave, kettle and toaster. There is an integrated dishwasher and lots of storage and the owners have furnished the kitchen with plenty of kitchen implements. There is a further freestanding storage unit. This living space is full of character, with latch doors, a lovely woodburner and beautiful views through two windows over the very secure garden. It has ultra comfy seating (2 and 3 seater new leather sofas plus two single wingback chairs, with plenty of cushions for comfort). The owners have a 40 inch Smart TV fitted with Sky TV too! This light and airy room overlooking the lane, has a king sized zip and link bed which can be made into twin beds if required. With side units and a handy chest of drawers. This double bedroom overlooks the leafy lane and has a double bed with side units and a handy chest of drawers. This large and airy room overlooks the garden and has a king sized bed. The wardrobes are all fitted providing lots of storage space. With a stylish white suite, corner shower, toilet and sink. This stunning room with double aspect views into the garden has formal dining seating for 6 people. It is a real suntrap and is the perfect place for sitting with a glass of wine, watching the dogs having fun in the secure garden. Feature ceiling beams and a lovely recess area. There is a side door and double patio doors leading into the garden. The hall, kitchen and dining room floors are all full tiled. Access to the garden is via the dining room through the patio doors. The garden is thoughtfully planted with plenty of lawn space, a patio area and summer house . There is lots of room for dogs and children to run about in. It is fully hedged and wire meshed all the way around. There are two 6 foot bolted entrance gates on the outside the garden. Back through the house to the parking area. There is a separate building which has a kitchen/storage room with worktops, fridge, sink and cupboards. Step down into another room which can be used for dogs as a separate feeding room or to use to rest in a cool environment if you have to pop out and leave them for a short while. Please do not allow dogs on human beds unless you bring your own bedding by prior arrangement. From the A149 Stalham bypass take the turning signposted Happisburgh/Walcott/Bacton at the western end of the town (Stepping Stone Lane B1159). At the end of the lane, turn left at the junction and stay on the road (still the B1159) for approximately 2 miles. As you approach East Ruston Church (the church on your right hand side of the road on top of the brow of the road), take the immediate right turning into Vicarage Road (signposted The Vicarage Gardens). Follow the road for approximately 1.5 miles as it becomes Happisburgh Road. At the T junction, turn left, then left again into Short Lane. Follow the lane as it bends to the right, and directly after the bend, Oak Cottage is on your right hand side. The most lovely week – perfect location & great dog beach. We couldn’t have had better weather either. Every little thing has been thought of at Oak Cottage & we didn’t really want to leave – thank you! Oh WOW! Love the house, first impressions were ‘I wish this was my house’. You really have thought of everything. Everything is really cosy and comfy, we really relaxed while we were here. The dogs couldn’t be more catered for. Good sized, secure and safe garden. We will definitely rebook and already recommended to friends! PS Best welcome pack EVER! What a stunning little place, first impressions left us lost for words!! A real home from home and everything really has been thought about, down to the fine decorative detail. A true retreat for the dogs, comfy beds and a superb secure garden, that they absolutely loved! Lovely base to get out and explore with beaches only a few moments drive away, closest being Cart Gap just down the road.